Are FaceBook Groups Any Good For Traffic Generation? I'm testing facebook groups as a means of free traffic and seeing some pretty good results. My method involves creating an image using the free image editor canva. On the bottem of the image I put a big call to action, "Comment INFO Below"
Then I run through about 20-30 groups posting the same ad. This usually gets me an initial burst of anywhere between 40-50 comments spread over the 20-30 groups. I then go to the notifications hit "like" and reply with "PM sent!" and then I PM them my link. From my tracking I am seeing about 15 clicks on my link. The first product I tested MMO niche generated 35 sign ups and 2 sales over a 3 day period. Has anyone else been using fb groups for traffic generation and would like to "brainstorm" to improve your results? Yup, I like FB groups... and I'm fairly happy with the results, by sharing my content in groups that allow me to. Personally I hate the "comment below" tactic, but if it works for you kudos. I'm really new to affiliate marketing but I have been wanting to try out stuff like marketing to facebook groups and stuff that I can do without having a following yet. Then I can at least make some money while waiting for the long term stuff to pan out, and getting some money to invest into websites and stuff wouldnt kill me haha. But I'm not really sure how to actually go about doing it effectively. Idk if I should be sharing images, or what. Obviously I should try to be commenting relevant and engaging stuff, but thats about all I know lol. any help/tips/pointers would be appreciated. Thanks. Thanks for the info. I have a moderately failed gaming blog but I could use it to try and target the gaming niche. Do you have to PM people tho or is just putting the link in the picture description not that bad? I feel like pming everyone feels kinda spammy. Because when they reply to your post commenting "info" they are asking you to send your offer to them. This is why I put the words "comment info" in my ad text and ad image. And then by following up their comment with "liking" it and "replying" to it. They are sent 2 notifications. That lead them back to their comment telling them to look for my message. I do this because when you message someone who doesn't know you, most of the time your message will go to their "other" folder. So my aim with all this "activity" in their notifications os to get them looking for the link I have messaged them. If you are looking for an automated approach this deffinetly ain't it. But it is a good way to get into the minds of your target audience and see what it takes to get them to click. Ah ya makes sense, maybe I'll try something like this out. Automated generally sounds nicer than manual but currently I'm making 0$ so this sounds ok. Could also help to grow pages which could be useful later down the road. Thanks for the info. Well Michael, its a good tactic as long as you're making sales through it. Make sure you give your activity a good break every once in a while to avoid the risk of losing your Facebook account. Because this can raise some flags specially in the closed groups. Comment Info Below tactic is done to increase engagment on your post. That way you get more eyeballs on your ad and that relates in more clicks to your offer. I would be interested in hearing more how you use groups. Especially if you "hate" engagement on your ads. I'm not sure what niche you're targeting. I'm targeting IM/MMO niches and I try and keep it simple. Usually I ask a question about something they are most likely struggling with in the text section above my image, e.g "Are you still struggling make money online?" Then I create an image with text offering the solution to them, e.g "Copy and Paste Income System Has Newbies Crushing It Within 30 Mins Of Starting"
Yup I know why it's done. I would be interested in hearing more how you use groups. I use groups in the way I described; sharing content that is welcomed by the community and the admin. Especially if you "hate" engagement on your ads. My personal opinion is when it comes to marketing is, real results are worth way more than looks. That's the great thing about entrepreneurship, we have the freedom to build our businesses in alignment with our values. There are hundreds of ways to do lead gen, finding the ones that are right for you is all part of the fun. wow very nice short but helpful minimguide! 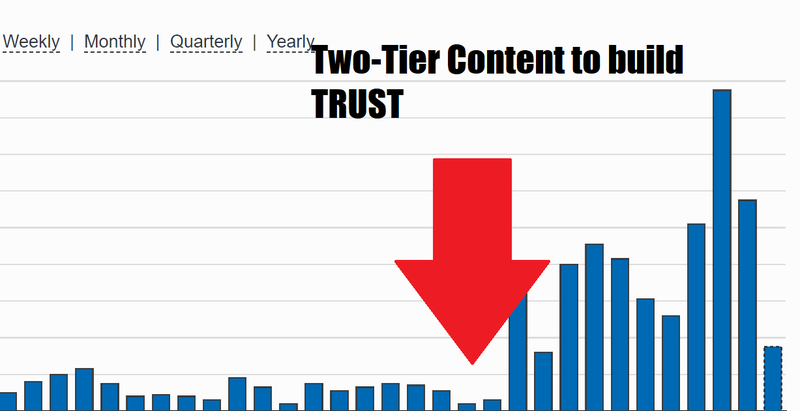 Here's a case study chart using 2 tier content in FB groups. See the improvement? We find they work very well for generating clients to our live events, which result in a lot of sales. There is a question though on their future as being free as Facebook are currently testing the idea of paid groups. 7 Underground, Unknown, Untapped Traffic Sources to Explode Your Traffic Stats! Thanks for the heads up about testing paid groups. If it did come about, that would mean your message is getting in front of people that are willing to spend money on getting information. As opposed the current free member model there is now. Facebook groups will be still free. They are just testing out the option for some group admins to charge membership fees. It's like a paid upgrade sub-group within a free group to provide additional access to special content, tutorials, live/recorded videos, benefits, tools, etc... . At the moment, I believe most or all of the membership fees go to the admin but I'm sure that would likely change if/when Facebook expands the pilot program on a larger scale. Think of it as a hosted membership platform for marketers in a variety of niches to generate income... a good idea IMO. Generating leads from facebook groups can really help you grow your business. If you are sending traffic direct to sales page without generating an opt-in list then you are missing out on a lot of potential sale. A FB group is good for what we can term an "oven"...a place for people to warm up to you and learn how they can make use of what you offer. Can you get a steady stream of qualified leads out of your oven? Absolutely...but it's going to take time to get going, just as any method to fill a pipeline will. > "Confused about sales & marketing? 7+hours of tips available"
Thank you to everyone who has contributed to this thread so far. Your points and feedback have been awasome! So I've run a direct link test for about 20 hrs. I posted a typical text and image post in about 30 groups last night as I outlined in the beginning of this thread. I also uploaded a 1 page PDF to about 30 seperate groups. And put in the post description the text "Easy copy and paste work -- Instant payments"
Here's my affiliate dashboard stats for the 20 hrs. Because pretty much all of my posts are still sitting at the top of the groups due to the engagment they have generated I'll leave it as it is for another 24hrs. Based on how it goes overnight I will decide whether to to put up a pre-sell page or "can it"
There's a couple of reasons for this #1 fb called me out twice in the 20 hrs for being a robot and threatened to block my account. #2 Even though the target audience on the surface seems very keen to want to make money online. A lot of their messenger communication suggests that they want it "all" to land in their laps with no work. E.g I recieved about 10 comments along the line of " I want to make money for free and not hard work." "I want to make money for free and not hard work." Surprising, isn't it? Spend some time on this forum and you'll understand why so many online money seekers fail at this work-required path. I use Facebook groups for organic traffic. It's pretty good, especially when I do a Facebook live and have a strong call to action. I've also found that keeping a 3:1 or 4:1 ratio works good. That means you have 3 or 4 regular educational messages and then 1 marketing message. That way your followers don't think your only purpose is to sell them stuff. Hope that helps. yes and if your posts are pinned then surely gonna get much traffic no doubt. "If you are looking for an automated approach this deffinetly ain't it"
Make Your First Sales Online With This DONE FOR YOU System! Great work by you Michael, I also use facebook groups and I like to use them as well. It is the best practice without paying and the best part of SMO. It's a lot messy with facebook groups these days as a lot of the publishers tend to promote programs they are into and it becomes very hard for one to get proper exposure for their business, groups that are heavily moderated seem like the best choice to me. that's what pinned post can boost up ! Most importantly is the quality of products or services posted in the group on facebook, the traffic will be good if optimizing the curious to the best user. Thank you very much for the post, this is what I need. Me as a traffic provider I dont need these tactics anymore, but before when I started with IM I used this and it worked! It would really increase the traffic but Ads Campaign is great! All the kids left Facebook years ago for Instagram (now Snapchat) and a number of businesses gave up on Facebook marketing efforts when "organic reach" plummeted. Despite this, there are still hundreds of millions of users still on Facebook. In fact, Mark Zuckerberg posted a status a couple of months ago stating that for the first time in the network's history, Facebook had over 1 billion active users in a single day. I like the concept of having a strong call to action. I believe that the traffic from Facebook is very useful, checked on my group and site. One group I run is adding over 100 members a day now (15,200+) & growing higher numbers daily. It is an advertising group aimed at home businesses, MLM (Network Marketing), affiliate programs. Yep - I have a pinned post at the top of the group telling people to read the group rules before posting followed by my own sales pitch for my ad. It's always at the top as a pinned announcement. In addition, as the group admin I can click the link to "Write Post" to welcome the latest new members which they are tagged in. You can do this for up to the latest 100 new members you added (I admin approve all member requests). So now 1-2 times a day I use that Write Post" feature and send a post to the newest members stating - "Welcome to our latest group members. Please read & follow the group rules posted in the description. Every day I have to remove multiple posts and ban people who break the rules in this rapid-growing group. Administration is increasingly time-consuming - so I'd appreciate you would consider joining as an affiliate in the (program I promote & link). When I make this welcome post, I now immediately "Turn off commenting" for this post for the following reason. When people comment, all people that are tagged in the post get notifications. I found I lost a number of members when commenting was turned on for the welcome post. You can ask up to 3 questions for pending members as they apply to join. I ask one - "Will you read & follow the group rules that are posted in the description?" About 60% of people answer that question. (Yeah - I know there is a rules section I can add as well now for group administration... which I will eventually get done). I do approve most of the members that didn't answer the question with a quick glance of what is shown to me about them in the pending members list. I've gotten better in identifying bogus accounts applying and ironically most of them answer the question. So anyway I do generate traffic & occasional sign-ups from my pinned post, welcome new members post & regular posts. I'll continue to experiment for what I will promote myself to see what works best. I started the group 4 years ago as I saw some groups in the niche 100,000+ members in size. All growth has been organic by people finding the group through Facebook search or suggested groups. Advertise ways for people to make money - home business opportunities, affiliate programs seeking affiliates, MLM (multi-level marketing) / network marketing company, direct selling company, party plans, business start-ups, franchises, etc... .
Posts off-topic will be deleted & members may be removed or banned. Make sure posts are visible for all to see - "Attachment Unavailable" posts will be removed. Thank you for this! I just applied to join your FB group! We are driving alot of our traffic from our FB groups to our website. As long as you manage to keep the FB group relevant, it will be great for your site. But there are chances of getting banned bc it'll look spammy. I also used the bands and it brought me a good result. You can work with this further and more. I checked with Google analytics referral and saw that we are getting decent traffic from facebook. You might want to check out yourself. Following relevant facebook groups is the excellent way to generate traffic for a particular niche website. Chances to get likes and followers may increase or you can get traffic from your geolocation quickly. Facebook groups were use to be good source of traffic but now its not that effective as now. you can share valuable content and start building relationships in the group and then start sharing your site links so they don't kick you out from group. Yes they still are if you are posting great valuable content in your groups based on your group members' needs and wants. I think established page is better than group . This is something that doesn't work for me. I even tried uploading tutorials to warm the audience up, but unfortunately no sales. I guess I have to try again. Yes definitely they are. You can share links of your website in various groups and get more and more traffic easily. One thing most people don't realize about FB groups and the algorithm is that Facebook will show your mutual friends of the same group a notification everytime that you post in the same group. So a simple trick to be at the top of mind is to be in the same groups as the majority of your friend's list so that they keep seeing a notification from you. Very great information with lots of useful tips which are very easy to follow by all. I tried several times to generate quality traffic from FB groups. Doesn't work for me.. Yes, it does work! Getting the right traffic to your websites via marketing from social media platforms does help only when the product that you want to sell is communicated well to the right audience. There are various strategies that one needs to apply to get the right traffic. FB groups are one of the big targets of the social media marketers. I haven't had much luck. Any recommendations? Yes it is really helpful to get traffic and a huge source of traffic in growing your business. This is one of the best and free ways to promote your app by posting about your new app to your friends and family on social networking websites like Facebook, Twitter, Instagram, Google Plus, LinkedIn etc. On this, social website there is a lot of groups, app installs and promotion groups which you can join and share your apps or games there for free. Among these all Facebook is my favorite .